Dark Rums [Dark rums are aged in manipulated barrels - heavily charred as well as steamed - but they are usually aged as long as light rums. Usually the producer adding some molasses. 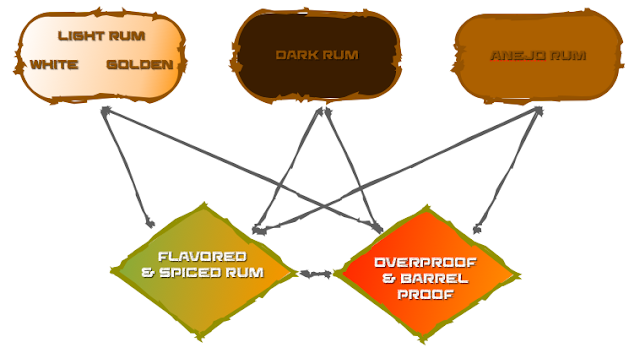 Even a tiny quantity of molasses is changing these rums to very dark. Often people think, that these rums are precious and long aged, but this is a wrong preconception]. Aged or Añejo Rums [there is no distinguishable line between golden rums and añejo rums - however I would draw it imaginary at around 5 years of classic oak barrel aging].